Steve Anderson, a 2009 Mount Michael graduate, shares his experiences of playing college football and of attending Mount Michael during his ESPN radio interview. Steve is the place kicker for Nebraska Wesleyan University and last week kicked a game winning field goal for his NWU team. 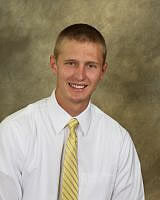 2011 graduate Jake Rauterkus joined Steve this fall on the NWU football roster.